Rock climbing with Pacific Center for Leadership focuses on developing trust, accountability and communication skills. Team members provide essential support that requires commitment to ensure each other’s success. Teams can learn how to work more effectively together through a highly stimulating experience, in a spectacular mountain environment. Under the watchful guidance of certified Association of Canadian Mountain Guides, participants have the opportunity of learning the basics of rock climbing, and discovering more about the strengths and attributes of their team members. Participants will learn how to put on a harness, handle a rope, belay their partner(s), and experience climbing up a rock face and rappelling to descend. Throughout the experience our professional facilitation team will encourage participants to pay attention to how they accept and receive support, and work together to achieve their goals. 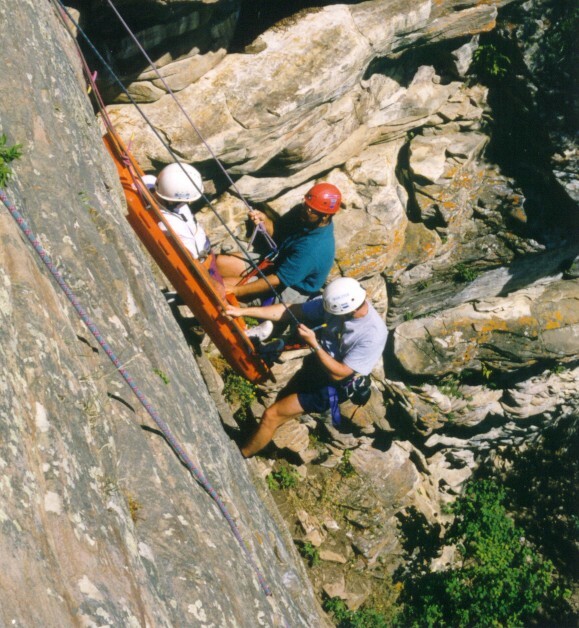 Climbing and Rappelling: In small working units of three, participants will climb up and rappel down the cliff face. Our rock climbing sites are chosen for their variety of climbs, enabling accessibility for participants of varying fitness and experience levels. Stretcher Lower: The team is assigned the task of lowering a member in a mountain rescue stretcher down a cliff face. The stretcher, guided by two people, is directed by the team members from the easily accessible area on top of the cliff. This engaging team challenge requires impeccable planning, communication, and leadership. This team development rock climbing session is a visceral experience. Participants learn how their personal actions, commitment and encouragement directly contribute to the results of their team members. This session positions teams to take their performance to the next level. Indoor climbing is also available in Banff and in Canmore. For teams who want to get into a different environment in a controlled setting, indoor climbing offers a team challenge with a varied spectrum of physical requirements. It's an excellent choice for exploring coaching and communication patterns.